Update for Dec. 13: This item is currently out of stock on Amazon, but it will be back in stock on Dec. 20 and is still available to order. Houston, we have a new Lego space shuttle sale! 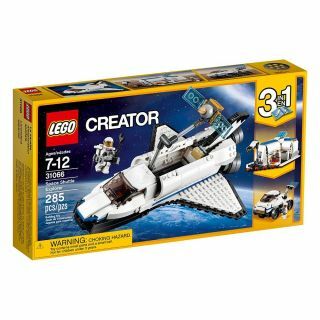 The Lego Creator Space Shuttle Explorer building set is 20% off on Amazon.com this holiday season, selling for $23.99 (down from $29.99, its lowest price so far). What makes the Lego Creator Space Shuttle Explorer set worthy of our pick is that it's more than a mere space shuttle building set. Lego's Creator series sets 3-in-1 kits that allow kids (and adult fans like yours truly) to use the same pieces to create two alternate models for extra play. In addition to the brick-built shuttle, future astronauts can assemble a Moon Station and Space Rover to help the astronaut minifugure included in the set explore the cosmos. We think Benny the Spaceman would be proud! Want more awesome Lego space fun? Watch my daughter and I build the Lego Apollo Saturn V set released earlier this year!